Information Technology - Get inspired to change the future of IT with innovative thought leadership. Upgrade your specialized skills with management skills and take change of the future. Begin the journey with Symbiosis Centre for Information Technology (SCIT), because we are thinking for your future. 1. Master of Business Administration (Information Technology Business Management MBA (ITBM) with options to choose elective Courses from areas listed below. 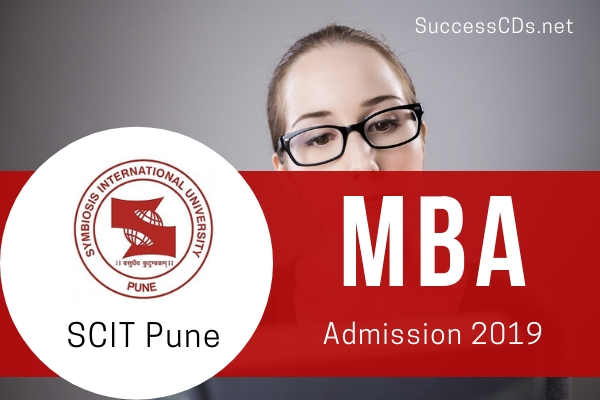 Announcement of Merit List with Waiting List status on the Website: 26th February 2019 by 8:00 p.m.
Last date for payment by the Merit List candidates: 21st March 2019 by 1:30 p.m.
MBA (ITBM) - Program: Applicant should be Graduate from any recognised University/ Institution of National Importance with a minimum of 50% marks or equivalent grade (45% or equivalent grade for Scheduled Caste/ Scheduled Tribes). Applicants appearing for final year examinations can also apply, but their admission will be subject to obtaining a minimum of 50% marks or equivalent grade (45% or equivalent grade for Scheduled Caste/ Scheduled Tribes). MBA (DS & DA) - Program: Applicant should be Graduate with Mathematics at +2 level from any recognised University/ Institution of National Importance and with a minimum of 50% marks or equivalent grade (45% or equivalent grade for Scheduled Caste/ Scheduled Tribes). Each student desirous of admission to SCIT must appear for Symbiosis National Aptitude (SNAP) Test 2018, which is a common written test for the admission to all Symbiosis postgraduate institutes. Preserve the Admit Card of SNAP Test 2018 for further selection process at SCIT. Appearing for SNAP Test does not automatically qualify an applicant for the next step in selection process at SCIT. Short-listed Applicants based on SNAP scores will be called for the selection process at SCIT, Pune. Short listed candidates are announced on SCIT website www.scit.edu as per the scheduled dates. Shortlisted candidates must fill the Application Form and book the slot for GE-PIWAT. Individual regret letters will not be sent to applicants who are not called for GE-PIWAT. The entire process will be held at PUNE only. Indian Bank Gateway iv) Demand Draft. While registering for SNAP, applicant has to also apply for SCIT in the same application form.A program fee of Rs.1000/- (non-refundable) is to be paid to SCIT for each program that the aspirant wishes to apply. Demand Draft(s) should reach the Symbiosis Test Secretariat by 5:00 pm on November 26, 2018. Demand Drafts reaching after this will not be considered and will be returned to the respective candidates.